If you are after a classic no frills type footwear, consider Nila by EOS in brandy. Exquisitely handcrafted in Portugal by skilled craftsmen, everything about this shoe screams quality. 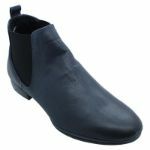 The lush leather upper fits you like a glove while the handmade leather lining and minimal heel ensures supreme comfort. This is a wardrobe staple to give your cloths a new lease of life.